Warning: This post contains pictures of the actual butchering process – they are real life and may be considered by some to be too gruesome – don’t say I didn’t warn you! One day that is easy to put off is butchering day. It always seems like such a monumental task – and it is! But, like anything, practice makes perfect – the more we do it the better and easier it gets! Last Wednesday was the fateful day for LBC (Little Brown Cow) who turned out NOT so little! He was almost four years old and more of a pet than the other steers we have butchered. Just think of a 1200 – 1500 lb puppy dog running to meet you as you enter the pasture- that was LBC – scary but at the same time cute! 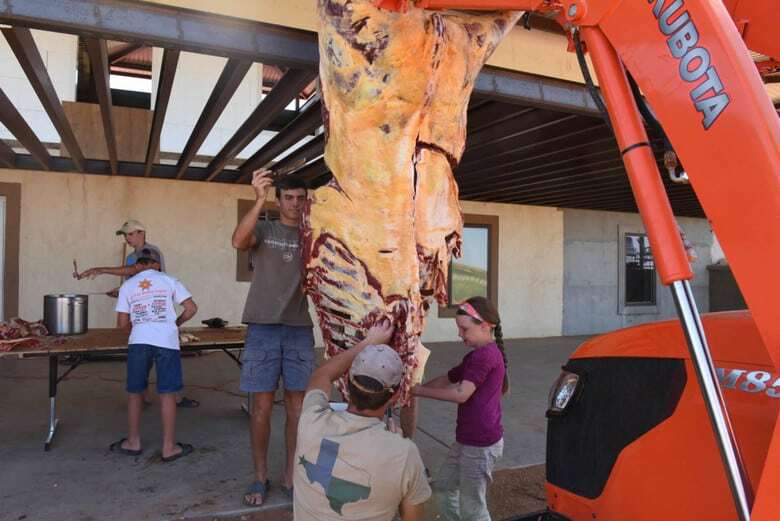 That big puppy dog of a steer ended up giving us 606 lbs of meat – 420.5 lbs of ground beef, 171.5 lbs of roasts and 14 lbs of liver – and, I forgot to weigh the heart. Butchering has become our main source of grass fed meat. Once our family milk cow delivers a calf, if it is a bull (male) we make it a steer and raise it for beef. Normally, we name the steer so as to remind us of his purpose in life, for example, Brisket and Hammi which was short for hamburger. You can read about our home butchering them by clicking on their names. With LBC, we again used the book, Basic Butchering of Livestock and Game. Wednesday morning began with shooting LBC with a one ounce slug which did the trick in a very humane and fast way – he didn’t know what hit him. This was the saddest part and there were tears shed! OK, I confess, I was crying but, so were the girls and even one of the younger boys. After all, he was so nice but then again, you can’t just keep a 1200+lb pet! We kept Margie and the other two calves in the milking parlor during this part of the process. They loved eating the grain they were given and didn’t even flinch when the rifle sounded! 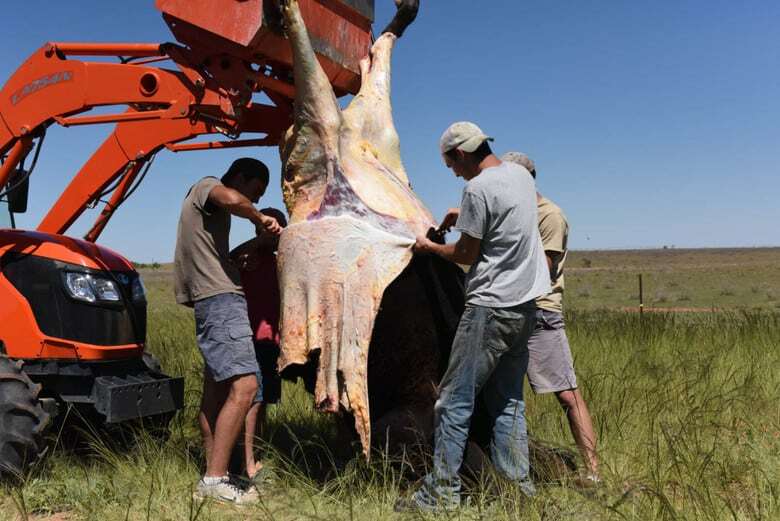 The next step was to carry him out of the pasture with the tractor and then begin skinning the carcass. You can see below that the boys get right in there to get the job done! 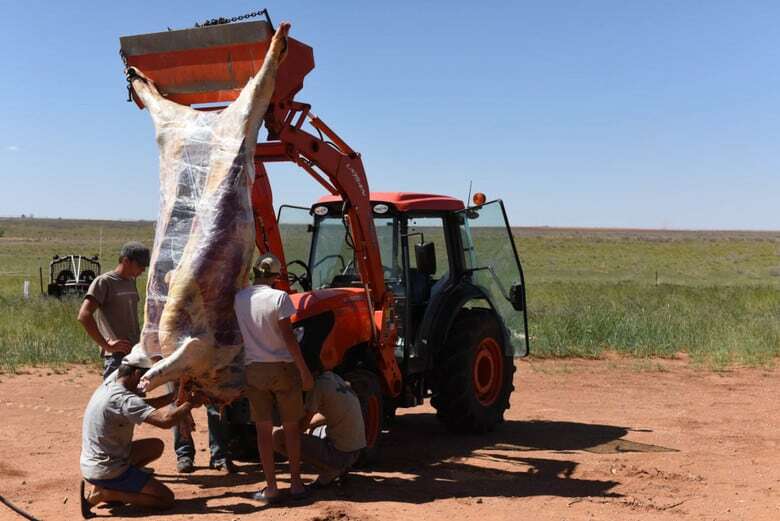 Beginning at the bottom of the hind legs, the hide was removed slowly and carefully because they had not yet decided whether to tan the hide or not. As with most things here, everyone gets involved – even our youngest daughter! This was quite an accomplishment because she took the killing part very hard. She loves cutting the tall rye grass and hand feeding the cows so, we had the opportunity to talk about the cycle of life. On a farm, everything has a purpose. The cows are for milk or meat, the chickens for eggs, even the dogs are for our pleasure or keeping the coyotes away – that is the way it is. I want our children to know where their food comes from! So, she was definitely a trooper and even got in on the processing! Once the skin was down to his front legs, it was time to cut into the chest and abdomen and take out his innerds. 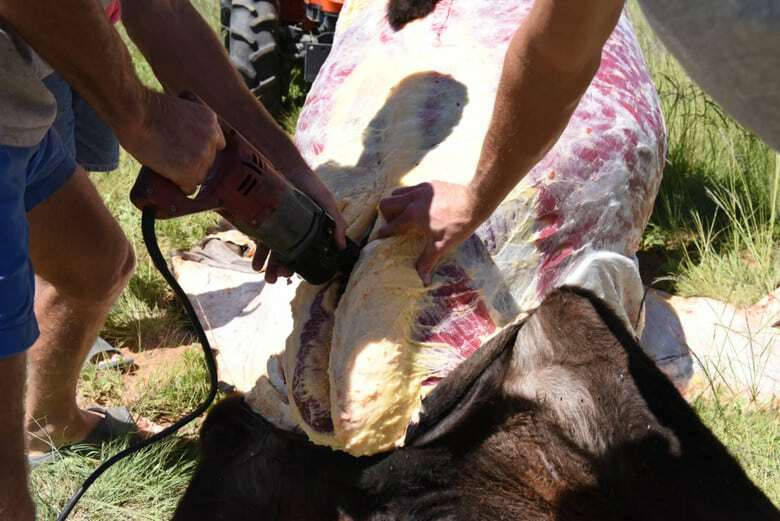 This is always the part of butchering that causes a lot of discussion because you don’t want to cut to deep and perforate the rumen or intestines – yuck!. John gets to do the honors on this and used the reciprocating saw or sawsall. You can see in the photo below that there was a lot of fat at the breastbone and the long saw blade goes deep. Once the breastbone is cut, another cut is made from the back down to meet the previous cut and a crowbar is used to separate the ribs and open the chest wall. The rumen and intestine are then rolled out onto the ground which you can see to the bottom right. Well, they don’t actually just roll out, the fascia and stuff that holds them in place has to be cut and then they sorta plop out. It looks like a huge balloon – but don’t pop it, that would be gross and stinky! 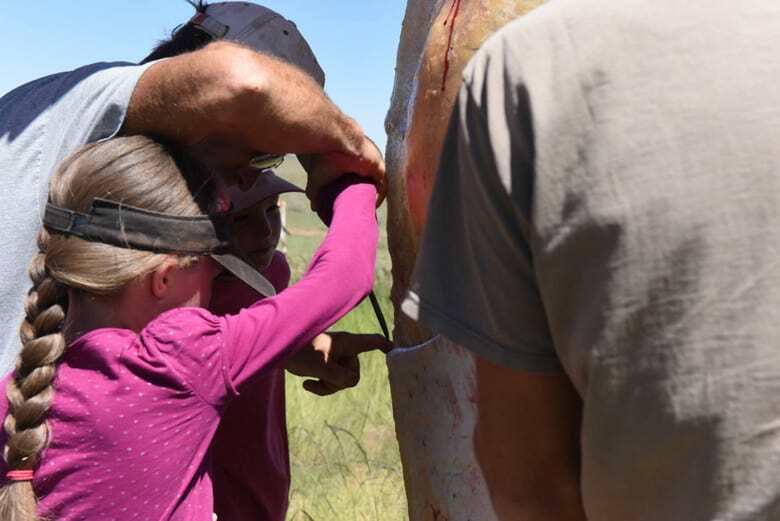 Not only does butchering our own cattle provide a great lesson about our food source but it is also a wonderful biology lesson. 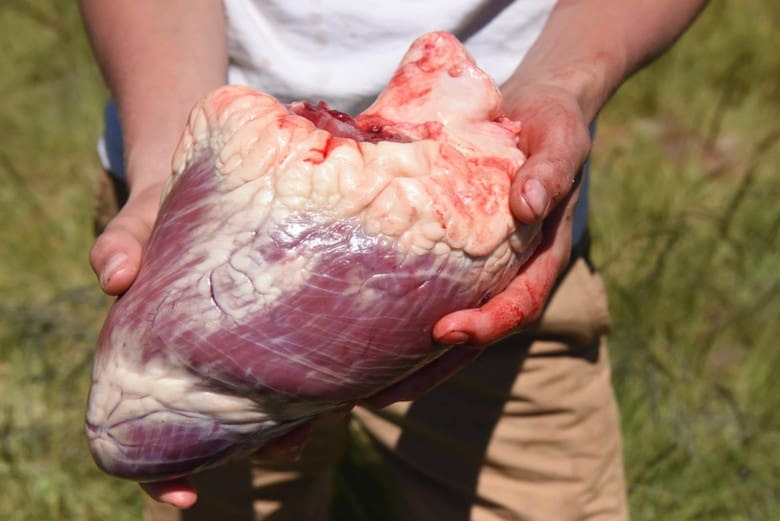 You can see how big the heart of a cow is in the photo below. Seeing the different chambers and vessels is amazing. Grilled Heart kabobs have become our traditional meal to celebrate the end of butchering and they were delicious on Thursday evening. Wednesday’s work was finished with wrapping the carcass in saran wrap and taking it to the barn for overnight storage. This allows the meat to cool down and the breakdown process of the meat begins which helps it become more tender. Thursday morning began with cutting the meat off the bones and processing it. The majority was put through a meat grinder and made into ground beef. The rest roasts of varying sizes. 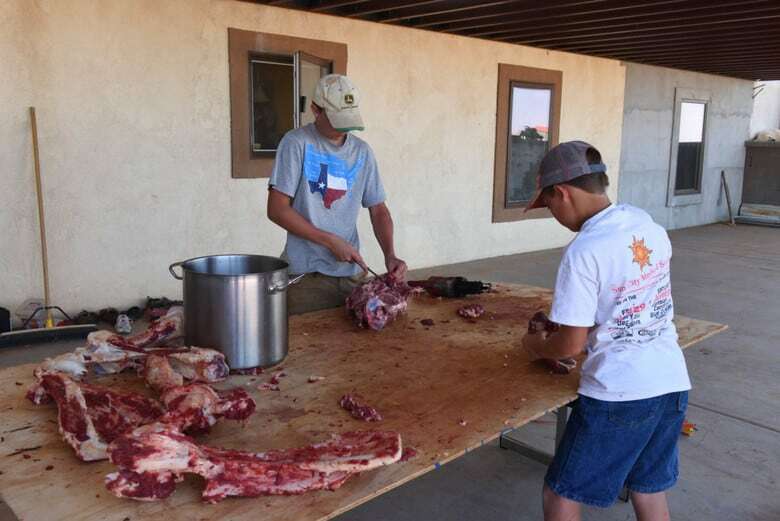 We set up a table outside the back door and the boys cut meat off, loaded a five gallon pot. Once filled, the pot was brought inside where John put it through a meat grinder and I packaged it. We packaged the ground beef in 4 lb packages and roasts ranged from four to ten pounds. Like I said, this was a family affair and everyone got in on the fun! You might be wondering what happened to all the bones as you look at this next picture. John and the boys used the saw and cut them up for me in lengths that would fit into my 5 gallon boiler. Can you believe we ended up with 150 lbs of bones which I packaged in 3 – 4 lb packages for homemade bone broth? I would never have dreamed I would be so excited about bones! So, the meat is spread over four freezers and my goal for this week is to get it organized and packed into one! But, we will see how much meat one freezer will hold! Oh, and then there are the bones…..
« Spring Vineyard – It’s Coming Alive! WOW! That’s my first lesson I’ll tell ya. There’s a lot of work that goes into that isn’t there. All that blood? I dunno if I can handle all that much. I’m lucky I can handle it once a day when I make supper. So the men and children handle the bulk work and you get to handle the gourmet. Hmmmm nope that’s still a whole lotta work, blood and gore. Nope I’d have nightmares the rest of my life I think… thanks for sharing though. Marie, that is funny! It is a lot of work but it is also essentially free meat. They are grass fed so its a good deal! 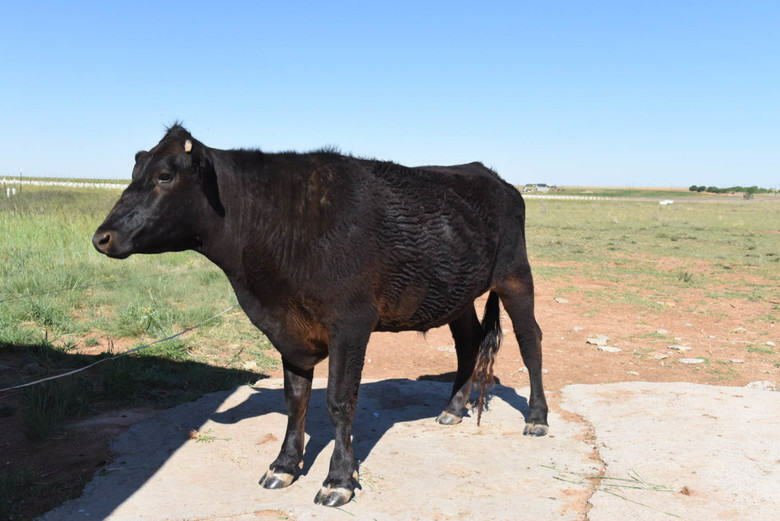 Growing up we raised our own beef cattle. We never butchered ourselves though. They were trucked off to the local butcher. Years ago every community in our area had one, not like today where there are mostly large slaughterhouses. 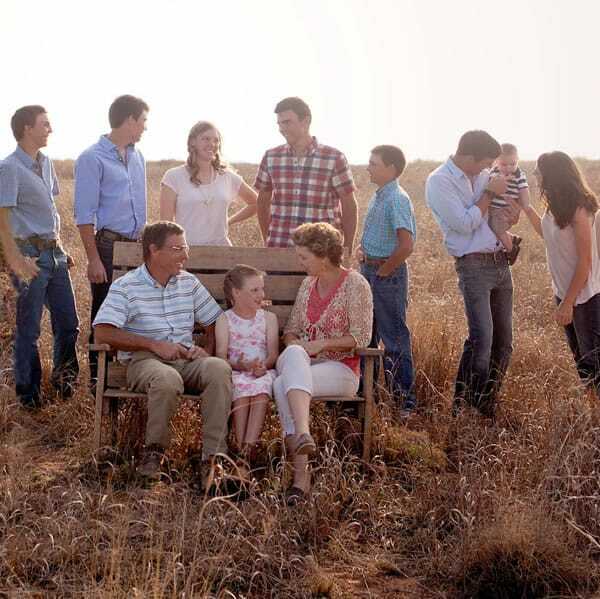 We are looking to buy land and start farming again and hope to be able to butcher ourselves. Do you bleed them out after the initial dispatching? Gay, after shooting, the carotid arteries are cut and we allow them to bleed and drain. 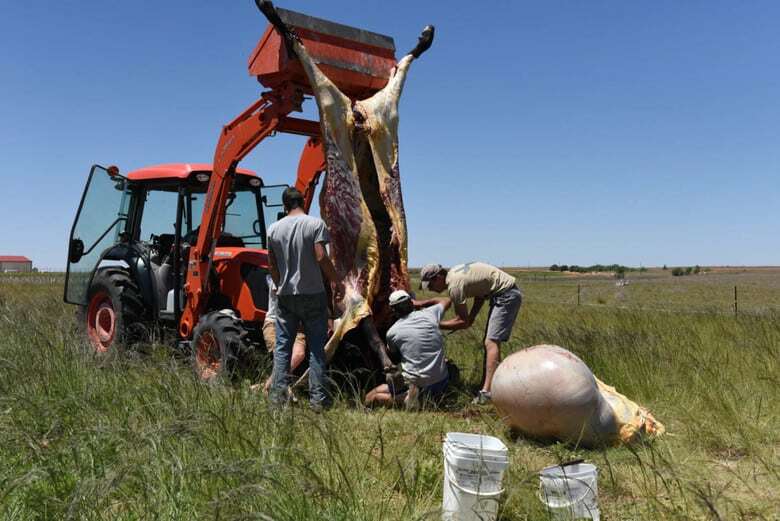 I don’t consider myself a conspiracy theorist but I have heard of a couple of people that took their grass fed cattle to be butchered only to find out that what they got back, was not there meat – what a shame! Another reason we started doing our own butchering was finances. When we began the vineyard, money was extremely tight (our house in AL had not sold) and we could do it ourselves cheaper even with buying a very nice meat grinder! I hope you will soon realize your dream of land and farming! Thanks for commenting, Gay and I hope you will be able to do the same too! SO, Marie…….Do you know how to tell that he was a grass fed cow???? For inquiring minds, that Want to Know…..